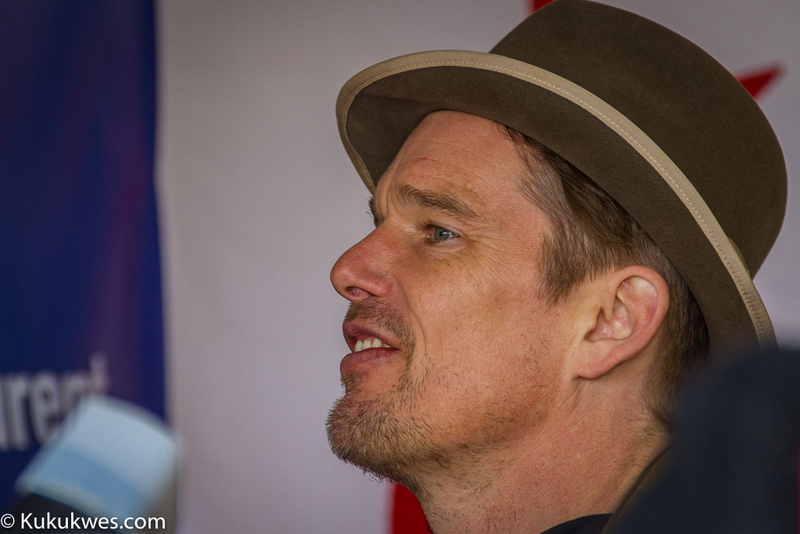 Oscar-nominated actor Ethan Hawke is offering his support to Mi’kmaq leaders in Nova Scotia and Quebec in calling for a 12-year moratorium on oil and gas drilling in the Gulf of St. Lawrence. 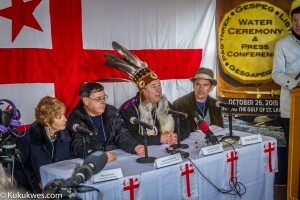 The actor, who owns property in Tracadie, N.S., was invited to take part in a water ceremony in Paqtnkek Mi’kmaw Nation before sitting alongside the chiefs in a news conference as they expressed their concerns for plans for offshore drilling in the Gulf. “I’m largely here as your neighbour and your friend and a friend to this area,” Hawke told reporters during the news conference Monday afternoon. “I’ve been coming here for the last 20 years. I’ve had a place here for the last 15. It’s an absolutely magical place,” he said. “My family settled in Texas at the turn of the last century. And if you’ve seen the waters outside of Galveston, you would weep. You would really weep,” Hawke said. 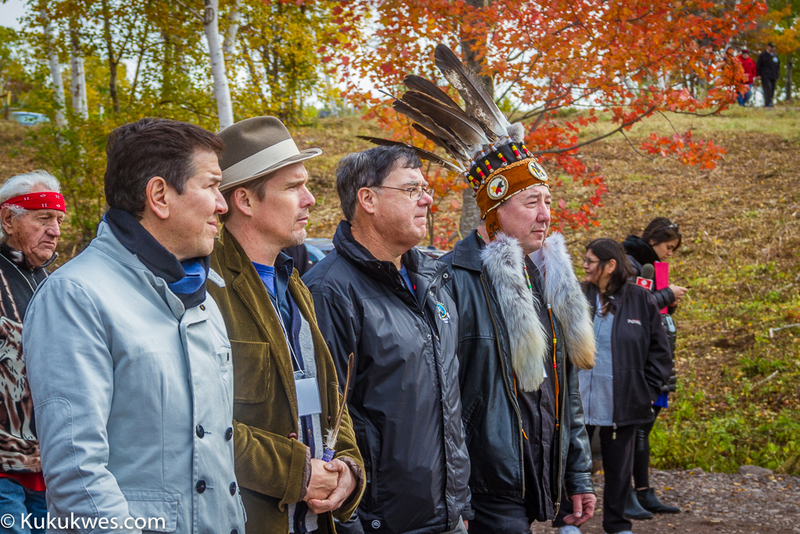 Mi’kmaq leaders from Listuguj, Gespeg and Gespegagiag in Quebec – which form the Mi’gmawei Mawiomi Secretariat – worked with officials with Paqtnkek and the Save Our Seas and Shores coalition to ask the Hollywood actor help them raise awareness about the negative effects of offshore drilling in the Gulf area. “So the one thing I can do as the one actor in the community is to blab a little bit and to sit next to really intelligent, dedicated people who are working extremely hard to protect this beautiful water,” Hawke said. The Canada-Newfoundland and Labrador Offshore Petroleum Board has issued a license to Halifax-based Corridor Resources to explore an area of the Gulf of St. Lawrence called Old Harry. It is located approximately 80 km west of Cape Anguille, N.L. An environmental assessment of a well is currently under review by the petroleum board. 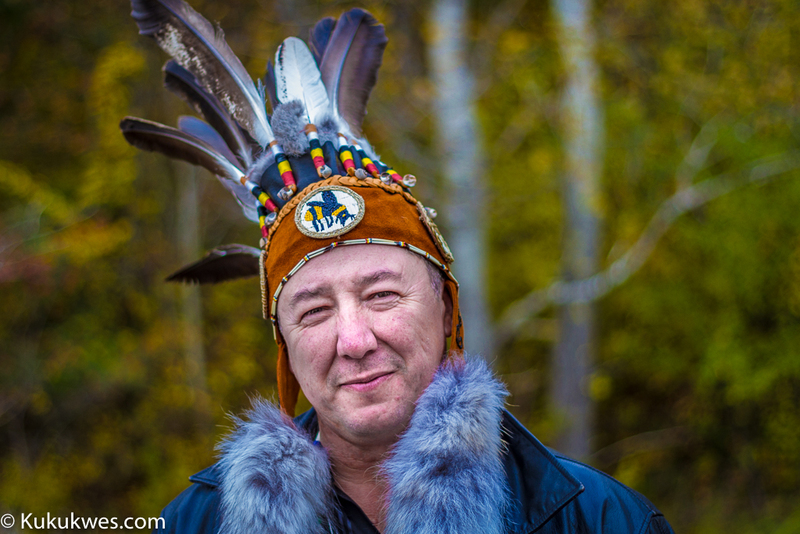 Troy Jerome, executive director of the Mi’gmawei Mawiomi Secretariat in Quebec, said Canada should not allow offshore drilling in the Gulf of St. Lawrence without first consulting with and speaking to the Mi’kmaq, Maliseet and Innu peoples. 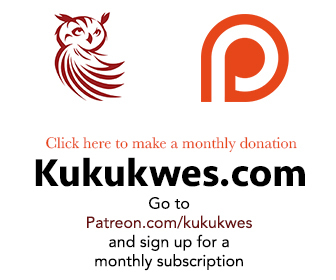 “And the way to speak to Mi’kmaq is to bring one comprehensive study that shows the body of water, the Gulf as one ecosystem and what could happen if there’s drilling,” Jerome said at the news conference. 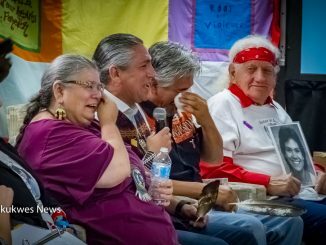 Those sentiments were echoed by both Listuguj Chief Scott Martin and Mary Gorman with the Save Our Seas and Shores coalition. Chief Martin said Atlantic salmon stocks, which are already in decline, will be affected by offshore drilling and exploration for gas and oil in the gulf. 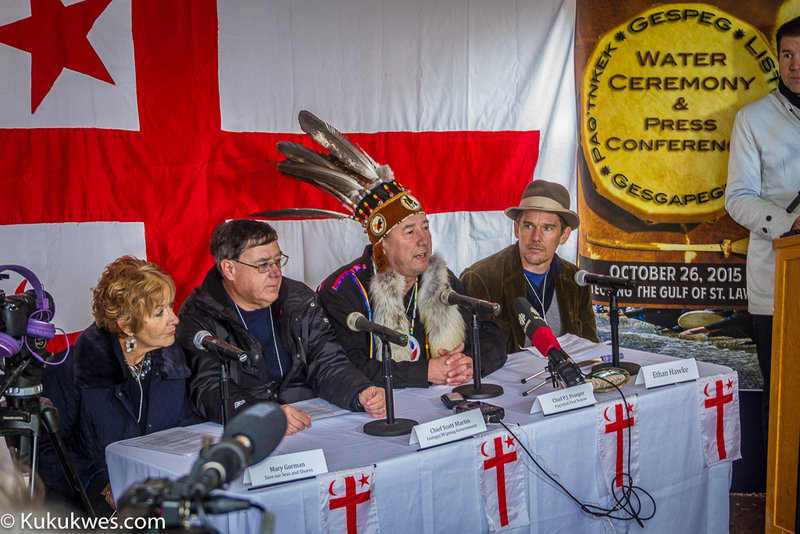 “Salmon is also threatened by pollution of the water course it uses,” Chief Martin said. “The warming of the surface waters, the degration of rivers, Maritime traffic and the presence of dams or work that block or limit its migrations,” he added. 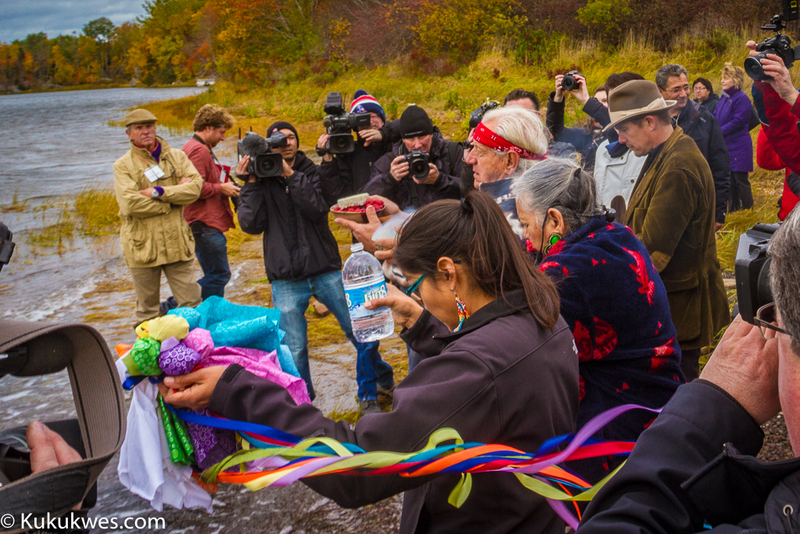 Prior to the news conference, Hawke joined Mi’kmaq leaders and community members in an annual water ceremony held along the shores of Pomquet Harbour in Paqtnkek. The site is significant because it was where the late Donald Marshall, Jr. was charged with catching and selling eels without a license in 1993. The Supreme Court of Canada overturned Marshall’s conviction in 1999 by ruling he had a treaty right to earn a moderate livelihood from the commercial fishery. “I was really flattered to be invited to be a part of this water ceremony,” Hawke said afterwards. “It proved just as beautiful as I could have possibly hoped on this magical day with the eagles flying above us,” he added. In the meantime, Jerome urged community members to contact their Liberal Member of Parliament in the province to address the issue before any drilling occurs. 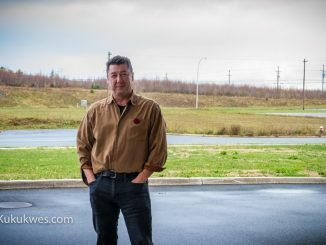 “There’s a sea of red and what we’re trying to do is make sure that all people from Nova Scotia go up to their MPs and ask, ‘What are you doing about the Gulf?’ “ Jerome said.